The health benefits of green tea seem to be popping up perpetually in the news these days. Just recently a published study found that drinking green tea increases the effectiveness of antibiotics. Good news for those suffering this flu and cold season! 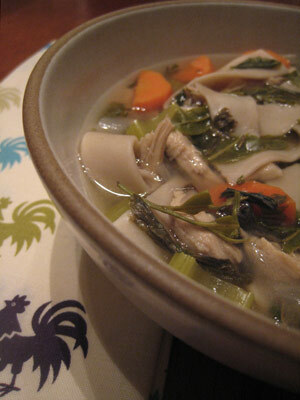 Another well-vetted remedy for these ailments is a humble bowl of chicken soup. Why not combine the two to give your immune system an additional boost? Yes, green tea can be incorporated into the broth of the soup, but did you consider for an extra-added health benefit that the steeped leaves could also be eaten—as a vegetable? Go ahead; incorporate some of the unfurled tea leaves within the soup instead of discarding them in the compost bin. In developing this recipe, I played quite a bit with the ratio of green tea to chicken broth. The tea adds subtle notes of astringency as its smooth, light-bodied flavor competes with the aromatic celery, parsley and peppercorns on the palate. Be it your goal to boldly bring forward the tea’s flavor or to creatively incorporate more green tea in your diet, try playing with the ratios yourself to suit your taste preferences. A good starting point is 1 teaspoon of loose tea per 1 cup of chicken stock. Interestingly, the noodles absorb the green tea flavor and color as they cook in the soup, providing yet another vehicle with which to consume the tea. As for any soup or stew, homemade stock makes all the difference in this recipe, adding a level of clarity and richness to the flavor. It is well worth the extra time it entails. Wishing you wellness this winter. In a large stockpot, combine the chicken with onion, 3 carrots and 2 celery stalks cut into two or three pieces, parsley stems, salt and peppercorns. Add 8 cups water (or just enough to cover chicken) to the pot. Bring to a boil, then reduce heat and simmer gently for about 30 minutes. Skim and discard impurities from the top frequently. When it is fully cooked, remove the chicken from the pot. Shred meat from bone when cool enough to handle. Reserve the shredded chicken for later use in the soup, and then return the carcass to the stockpot. Continue simmering, uncovered for 3 hours or more, adding water as needed to keep the carcass covered. Taste the stock and season with salt and pepper accordingly. When stock has reached desired richness, strain into a clean heatproof bowl, discarding all solids. Let the broth cool, uncovered, and then chill in the refrigerator (or force chilling more rapidly in an ice bath). When ready to finish soup, skim the fat from the stock and return it to a stockpot with 3 carrots and 2 celery stalks roughly diced, chopped parsley, and the shredded chicken. Bring the soup to just above a simmer. Withdraw about a cup or two of broth and pour through a steel mesh tea filter or disposable t-sac filter bag containing about 3 tablespoons of green tea leaves. Allow tea to steep for 5 minutes. While the tea is steeping stir the dry noodles into the soup. When steeping is complete, return green tea broth to the stockpot, adding a portion of the steeped tea leaves as well. Continue to simmer about 5-10 minutes more or until the carrots are crisp tender and the noodles are soft. Season with salt and pepper before serving.